Want a unique gift with spiritual significance that shows your thoughtfulness? A Revival History gift card is a perfect solution. RevivalHistory.com is now offering gift cards which will allow that special someone to get just what they want to grow in their Christian faith. It can be hard to choose what to give a loved one on special occasions but not with this unique option. 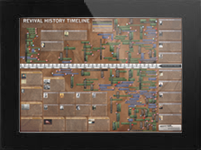 Your recipient will be able to choose from a Revival History Timeline or historical classics from A. A. Allen to Smith Wigglesworth and revival chronicles like Voice of Healing magazines. They could purchase various publications filled with testimonies and articles from giants of our faith or even audio mp3’s of live miracles taking place. Our site grows continually so even more options will become available. Leave the choice up to your loved one and you can never go wrong. Your Gift Card with the amount you choose, will be sent to your own purchasing email address. Your specially made Gift Card email should arrive to your inbox within 1 business day of receiving your order and will have a beautiful PDF attached. The PDF will include a personalized gift card code. Simply send the attached digital Gift Card PDF in an email to a person of your choice with your own message. Want Gift Gards for more than one special someone? Purchase your quantities, you’ll receive one email with all your PDF Gift Cards. Save them all to your computer, then simply attach the appropriate Gift Cards of your choice to whomever you wish to email them to. A simple and meaningful gift. -Recipient will have 12 months from date of issue to use gift card before expiry. -At this time, the full amount of the gift card must be spent during one purchasing session only. Any unused total from a gift card amount, will expire after the first purchasing session. -Any total not covered by the gift card amount will be payable by the gift card holder at time of use.